I recently finished a meals review of a residential care facility where 60% of the residents required texture modification of their meals. I am seeing the dilemma – and the opportunity – of catering to this large cohort of people on texture modified diets, in residential care and in the community. Staff at this busy facility (like many I immerse with), plate the food in the dining room. Texture modified components are brought from the kitchen in small containers, one container for each component of each texture. I often see 12 containers of texture modified components for each dining room – meat and 3 veg times 3 textures – plus gravy/sauce. Staff are given scoops for portion control, and place a scoop of each on each plate, and top with the gravy/sauce. 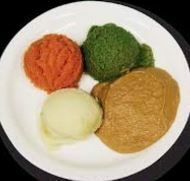 Each well blended component is a uniform colour, sometimes resembling the component, often a dull grey, depending on the amount of time cooked, reheated and held hot. Over the past 2 years I have seen the rise and rise of food components that are moulded into the shape of the food item. Is this the answer? After all, “we first eat with our eyes”. The issues I see from the consumer’s perspective, when I sit and share meals with them, are 5-fold. Lets look at carrots as an example. Reheating – Due to the extra handling involved with preparation, there is an increased potential for cross contamination. Cases of foodborne illness have been attributed to hygiene failure during this process. Food authorities recommend foods should be reheated to 70°C for 2 minutes (or equivalent) prior to serving. I have seen texture modified components placed in a combi oven for reheating for up to 60 minutes. Hot and extended reheating can result in overcooked, murdered carrots and changes the colour away from an eye-popping bright orange. If the meal is reheated in the dining room, staff may give it a zap in the microwave for 5 minutes on high, just to make sure it is hot, safe and reaches temperature. I have seen some gorgeous photos of amazing looking, exquisite texture modified meals on LinkedIn, Insta and blogs. Well done to the creators, whether internal at a facility or an external specialised production site. My challenge is to have the meal looking that way at the time the resident receives it and is ready to eat. I also recommend staff get creative with presentation of non-moulded components. Keep cooking, reheating and hot holding to a minimum to maintain maximum colour and taste. Season well and add butter, cream and other tasty nutritious options to ensure the right texture. Pure food, brightly coloured, that smells and tastes delicious will go a long way with increasing consumption and satisfaction. Discussion about the meal and photos of the components can aid with memory and guide the eater. Set your staff up to succeed with this increasingly vital and challenging task?